We don’t drink much alcohol, but when we do it must be something special, with lots of flavours. Caribbean spiced rum is one of our favourites. We like it in mojitos, in strawberry daiquiris and rum punches, of course. This is less classic version of Caribbean rum punch, it does not have fruit juice, instead it is made with coconut milk and sweetened condensed milk. If you have time best infuse coconut milk with cinnamon and nutmeg before hand. To make the drinks combine previously infused coconut milk with condensed milk and rum. You can even spice up the whole batch of coconut milk by adding the spices and leaving it overnight in the fridge. For 1 l of milk you will need ½ tbs cinnamon and 1 tsp of nutmeg. Skip the rum for kids’ version, they will love it. As rum punches are Caribbean thing I’m adding this to the Inheritance Recipes link-up that we co-host together with Solange of Pebble Soup. 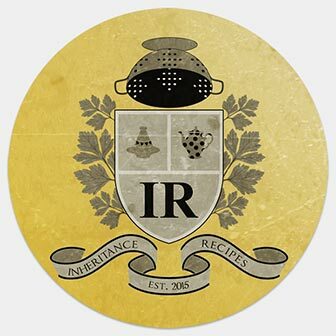 September Inheritance Recipes is hosted by us, please come and join us, share your inherited recipes! An yes it is quite delicious and awesome during X-Mas Season.